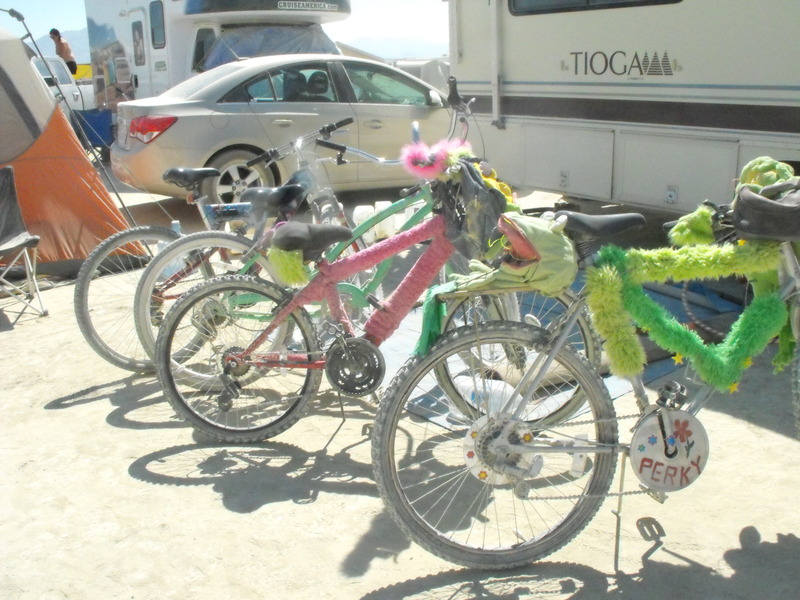 Many older people won’t go to Burning Man out of concern for their mobility on the Playa. It’s an appropriate and understandable worry – especially for those of us who find “getting around” a lot harder than it used to be. Black Rock City, while a small town in many ways, is vast when it comes to transporting yourself from point-to-point. Restrictions on the types of vehicles available means that most people either walk or bike to get anywhere. The surface can be tricky at times, with sand build-ups that can present pedaling challenges should you encounter one of these “mini-dunes” unexpectedly. To find out more about BRC’s Department of Mobility camp and the services it offers, contact Brcmobility@gmail.com or Hotwheelz.camp@gmail.com. But you can also take the route of independent transportation by bringing your own special vehicle and licensing it through the DMV (Department of Mutant Vehicles). There are restrictions and limitations on such vehicles such as size and type of vehicles (see the list below), but there’s plenty of room for creativity and there’s a genuine desire for inclusiveness (Radical Inclusion one of Burning Man’s “10 Principles”). Our bikes ready for a day on the Playa. I remember one pedal-powered art car built in the shape of a foot, and operated by a Burner who was actually missing one of his feet. The vehicle not only gave an otherwise disabled person a means of transportation, but also made a public statement that both grieved for and celebrated the missing limb. Those with mobility challenges can also choose to traverse the Playa on one of the plethora of art cars, but will have to cope with the randomness of art car routes — recognizing that you could end up stranded far from your home camp. Fortunately for all of us attending Burning Man, the Playa provides, and there’s usually plenty of help anytime we find ourselves in jeopardy. “If you have a physical disability, you should be able to receive a disabled license from the DMV. Pre-registration is necessary. Please go here to find out more about vehicles and transportation for those with disabilities. To reiterate one of the most crucial statements from the above directive: “Pre-registration is necessary.” Coming to the Playa unprepared and trying to meet a special-needs situation on the fly can result in disappointment and a bad Burn experience. So check all the information carefully, and come well-prepared to meet your personal mobility needs. But one thing you will never find at Burning Man is rejection of people based on disabilities, or on any other inherent issue. We mean it when we say “Welcome Home” to everyone who arrives at the gate.